If you savour the concept of a British village in the middle of the twentieth century it is all too easy to think of a chocolate-box scene with cottages and houses surrounding a duckpond with a postman cycling by whistling while a farmer drives his sheep to market. So it may come as some surprise to learn that thousands of villages were surrounded by camps occupied by foreign servicemen and women, governments-in-exile and refugees from continental Europe. The majority of the visitors had never been to Britain before and fewer still had set foot in an English village. In 1944 over a million more American GIs arrived to prepare for the invasion of Europe. Few of them had left America before and by the time they arrived in unfamiliar Britain they had suffered a debilitating troopship crossing of the Atlantic in their convoys, dodging submarines, landing in Northern Ireland before being billeted who only knew where. They were put up in remote country villages where no restaurant had even heard of – let alone served – a hamburger. The lack of showers, central heating and lager led many to feel homesick initially, but some grew to love the pretty countryside and the quirky English ways. By and large they were welcome guests and had a good reputation among local communities for putting things right if they went wrong. A schoolboy in Dorset said that a neighbour had been delighted when his farm, damaged by American tanks on manoeuvres, was restored within a week. They repaired all the hedges and even helped out with the harvest, towing the old- fashioned binding machines with their jeeps. Another group damaged an ancient gateway leading to a fine manor house but restored it to its former glory in two days. The owners of Peover Hall in Cheshire were not so enthusiastic as the farmer in Devon. The US Third Army was based there and General Patton had his headquarters in the large Georgian wing in the build- up to D- Day. In 1944 a fire was started by a soldier and the house was so badly damaged that the wing was demolished after the war and the house returned to its pre-Georgian dimensions. The arrival of Americans in such vast numbers had a major impact on life in certain areas of Britain. The fishing village of Fowey in Cornwall had the magnificently named USN AATS B, or the United States Naval Advanced Amphibious Training Sub Base, which trained at Pentewan Beach twelve miles to the west. The officers were billeted at Heligan House and 850 men lived in tents. It was said that in the build- up to D- Day it was possible to walk across the river from Fowey to Polruan on American boats and landing craft, a distance of over 400 metres at high tide. Soldiers charged around the tiny narrow lanes in convoys of jeeps, while the village halls shook to jitter- bugging and children crowded around for sweets and chewing gum, which the Americans seemed to have in unlimited quantities. The citizens of Fowey quickly became used to their new guests with their enthusiasm and energetic attitude towards life. Then one day they woke to find the harbour empty and the Americans gone. They, like all the other GIs spread across the south-west, had left the shores for the beaches of Normandy. The US 333rd Field Artillery Battalion (FAB) arrived in Britain in February 1944 in preparation for the Ardennes offensive, or the Battle of the Bulge. The soldiers were a black battalion from Alabama, a small number of the 130,000 black soldiers billeted in Britain from 1942 onwards. For many inhabitants of the small Cheshire village of Tattenhall, where the US 333rd FAB were housed, it was the first time they had encountered a black man. Equally, the Cheshire countryside provided a novelty for the southern American soldiers: it was the first time they had ever seen snow. They were billeted in and around a house called the Rookery, hunkered under the commanding ruin of Beeston Castle which is situated on a magnificent rock towering over the Cheshire plain and leading the eye westward to north Wales. Alabama in 1944 was still a segregated state and the soldiers had to be reassured that it was permissible for them to walk on pavements or go into the same pubs, shops and restaurants as their British hosts. When the 333rd Field Artillery Battalion left Tattenhall in summer sunshine six months after they had arrived in snow, one of the soldiers, Private George Davis, wrote, ‘We have found Paradise’. Tragically, many of the soldiers never returned to Alabama. Some were killed or captured near Antwerp but Davis was one of eleven soldiers who became separated from the rest and was hidden by a sympathetic Dutch farmer, only to be betrayed by a Nazi sympathiser and brutally murdered by the Germans at Wereth. The British countryside opened its heart to the incoming soldiers but nothing could protect them from the brutality of war. Their stories feature in the final chapter of Our Uninvited Guests. By the summer of 1940 Britain stood alone on the edge of Europe with nothing to protect her apart from the Channel. This is an oft stated fact that has become entirely accepted by the majority of people. But is it true? Strictly speaking, yes. Geographically we stand on the edge of Europe and always have done. There is nothing new in that claim. But the implication here when set in the context of the early summer of 1940 is that plucky little Britain with its population of 38 million standing shoulder to shoulder faced the threat of a German invasion entirely alone and with no support from anyone. That is the bit that is not true and it does history a great disservice to ignore the massive contribution made by our friends and allies both that summer and in subsequent springs, summers, autumns and winters that followed. signposts were removed all over the country in order the thwart the Germans had they invaded. By the time the Battle of Britain took place, London was host to seven foreign governments-in-exile and the hot-headed French General, Charles de Gaulle, had arrived as well. None of them came empty handed. The Norwegian government lent the British more than 1,300 vessels from their fleet, the fourth largest and most modern merchant fleet in the world, which sailed with the Atlantic convoys for the whole war. In 1941 a British official declared that the Norwegian merchant fleet was worth ‘more than an army of a million men’. That was an enormously valuable contribution and one that was not without risk. Many Norwegian sailors would lose their lives in the heaving seas of the submarine-ridden North Atlantic. In addition, King Haakon of Norway brought 1400 soldiers, 1,000 sailors and a small number of pilots that grew rapidly over the next few months. The Belgians donated their substantial gold reserves and over the course of the war shipped 1,375 tons of uranium from their stocks to the USA to fuel the Manhattan project. The Dutch government and their magnificent Queen Wilhelmina, who was described by Churchill as ‘the only real man among the governments-in-exile in London’ brought six hundred ships from its mercantile fleet and rich resources from the Dutch East Indies. The Czechs brought brilliant intelligence from inside Nazi Germany. Their main agent, A54 as he was always known, was a high-ranking Abwehr officer who divulged highly valuable secrets until his eventual capture in 1941. He told the Czechs about the build up of Goering’s Luftwaffe, he gave them the code for German wirelesses in 1938. It was a sinister code: Heil 15 März and a week before Prague was invaded (on 15 March 1939) that the Germans had been instructed to round up all intelligence officers and treat them with great harshness. His warnings helped the intelligence services to evacuate to London the night before the invasion. In 1942 two Czech agents carried out the most audacious assassination of the highest ranking Nazi to be murdered: Acting Reichsprotektor Reinhard Heydrich. The agents were trained in Britain and flown to Bohemia by the RAF. Our past is inextricably linked to the former Czechoslovakia. Charles de Gaulle’s contribution would take longer to materialise but his presence in London cannot be underestimated. Churchill, passionately supportive of the French, gave de Gaulle every encouragement as he gradually built up the Free French army and encouraged the development of the Resistance. Many of the agents were trained in Britain and used safe houses all over the country, including one in Sussex which features in Our Uninvited Guests, to stay while waiting for flights into occupied France. The Poles brought fighter pilots among a total of 8,000 airmen and 20,000 soldiers as well as hundreds of sailors manning three destroyers, two submarines and a number of smaller vessels. By the end of the war the Polish were the fourth largest Allied Force after Russia, the USA and the British Empire. Critically they also sent an early decoded version of the Enigma machine. Yes. That’s right. Enigma. You know, the one that we make so much of. It was the Poles in 1932 who first worked out how to use the German Enigma machines and they had been reading German messages for the greater part of seven years by the time the war broke out. I’m not saying the coders at Bletchley Park could not have done their work without Polish help but it might not have happened so quickly. We owe the Poles far more than we ever imagine. That is why I have dedicated my new book to them. They might have been Uninvited Guests but they were brilliant guests to have on our side. Until the entry of the USA into the war, Britain relied extensively on this generous support from its continental allies. We owe them an enormous debt of thanks and that is why they are all mentioned in Our Uninvited Guests. The strange thing about writing a book is that it starts as a germ of an idea and ends by being a public object. It is a bit like having a baby who grows into a child and then is suddenly thrust out into the world entirely alone to be loved or hated without protection from the parent (me). When I first had the idea for Our Uninvited Guests it was a completely different creation in my mind. My son Richard and I were in Harrogate in 2012. We had been looking at Commonwealth War Graves Commission cemeteries in the north east because I had been asked by the Commission to write panels to explain why there were large groups of CWGC graves in civilian or military cemeteries in this country. It is a little known fact that there are 13,000 Commission burial plots and cemeteries in Britain. But that is an aside. We were staying near the Hotel Majestic where, I was given to believe, my great-grandfather, Harry Summers, had spent the last ten years of his life. In fact, it turned out he had not lived at the Majestic but at the Prince of Wales Hotel. However I only discovered that last year. My interest was piqued by the idea that all the grand hotels in this magnificent spa town were earmarked by the government for requisitioning in the event of war and that is indeed what happened. The Hotel Majestic was taken over by the RAF; the ballroom at the George Hotel housed the General Post Office and so on. It was said that had London been bombed flat, the government planned to move lock, stock and barrel to Harrogate. So was born a book proposal entitled Hotel Majestic. The subtitle was always ‘the secret life of country houses 1939-45’. The more research I did the more I realised that it was the people and their lives in these houses rather than the houses themselves that interested me. Of course it is interesting to know that the government decided, in 1938, that any house with more than four rooms downstairs could be requisitioned under the Defence of the Realm Act. My house would have escaped but my sister’s would not, for example. So yes, the obvious places such as Bletchley Park, Woburn Abbey, Chatsworth, Blenheim Palace were taken over but so were smaller properties all over the country. In St John’s Wood a house with a garden that led straight onto Primrose Hill was commandeered by the Air Raid Precautions Unit while a small manor house in Sussex was used as a safe-house for French Resistance couriers en route to France. Further, I discovered that the Ministries of Information, Food, Supply, War etc could take over any building they wanted almost anywhere in the country with barely a shrug. Greater Malvern became infested with civil servants, BBC employees and later Radar technicians. The one thing in that town in short supply was school boys. They had been ousted and were living at Blenheim Palace. In Aylesbury, for example, no fewer than 60 properties were requisitioned in whole or in part. Sometimes the Ministry of Food forcibly commandeered freezers from ice-cream parlours, refrigerated plants and garages. At other times they took over tracts of land for access. The armed forces had almost carte blanche to occupy whatever they required. A chaotic picture began to emerge and I soon realised that government bureaucracy, while fascinating for a page or two at most, is actually a killer. The book soon gained a new title: Behind Closed Doors. This very nearly stuck but there are a number of books and films with that name and the publishers decided in the end it should change to something more focused on the people rather than the houses. People matter: they are endlessly fascinating and almost always surprising when placed in unusual juxtapositions. BBC employees with beards cycling around the West Midlands are far more evocative than Nissen huts in Tewkesbury. Nuns in purple habits walking through the wild countryside near Bridgnorth captured my imagination as did an American journalist crawling over the heather in Northern Scotland. Why was there a pregnant mother from the East End sleeping in a hospital bed in the Prince Regent’s suite in a country house in Hertfordshire and why was a forger living in Audley End? What were they doing there and how did they cope with being completely torn from the roots of their former lives? The Prince Regent’s Suite, Brocket Hall. During the war it was used as the recovery room for women who had given birth in Lord Melbourne’s bedroom. The women came from the City Maternity Hospital in East London. This is the question at the heart of my new book Our Uninvited Guests. If you have time to read it you will meet some of the most beguiling characters imaginable. I have favourites but I won’t spoil it by telling you who they are. Suffice it to say that this book has been one of the most delightful and challenging I have ever written. It took longer than any other both to research and write but the rewards for me personally have been immense. I hope they translate into a rewarding read. This book came about as a challenge from Julie’s editor to see if the Women’s Institute did anything interesting in the Second World War. As a result of the research she carried out over four years the conclusion she inevitably came to was that there a wealth of material. The year after the book was published ITV bought the rights to turn it into a television drama. It ran under the name of Home Fires for two seasons in 2015 and 2016. The true story of the country women who kept the countryside ticking is what is on offer in Jambusters (Home Fires in the USA and Canada). Coming just 21 years after the First World War what do you think women feared most from the Second World War? How much did the WI’s Pacifist stance affect the way it was perceived by the British Government? How important was a sense of humour during the war? Were you able to relate to any of the characters in the book and if so, what drew you to them? Has the author got the balance right between using her research to tell the factual story and her writing abilities to create an engaging narrative? Do you think today’s women would rally to the support of the government in a future war and if so, what would be their main focus? Did this book change your opinion on the Women’s Institute or the role of women on the Home Front in the war? Sunday 8 July 2007 and the market town of Henley-on-Thames is enjoying a warm afternoon. On the Buckinghamshire bank of the River Thames the scene is one of colour, pageantry and tradition: blue and white striped boat tents marshaled neatly between the pink and cream Leander Club hard up against Henley Bridge, and the white marquees housing the grandstands and Stewards enclosure on the downstream side. It is finals day of the regatta, the day when lives are changed forever by the outcome of an individual race. At 3:50pm two crews of nine boys line up at the start, next to the lozenge shaped island in the middle of the river crowned by an elegant temple designed by the 18th century English architect, James Wyatt. The umpire is standing in a handsome launch, arms raised holding a red flag vertically above his head waiting for the two coxes to indicate that their crews are all set. ‘Are you ready?’ He sweeps the flag down sharply. ‘Go!’ Sixteen blades dip into the water. They are off. 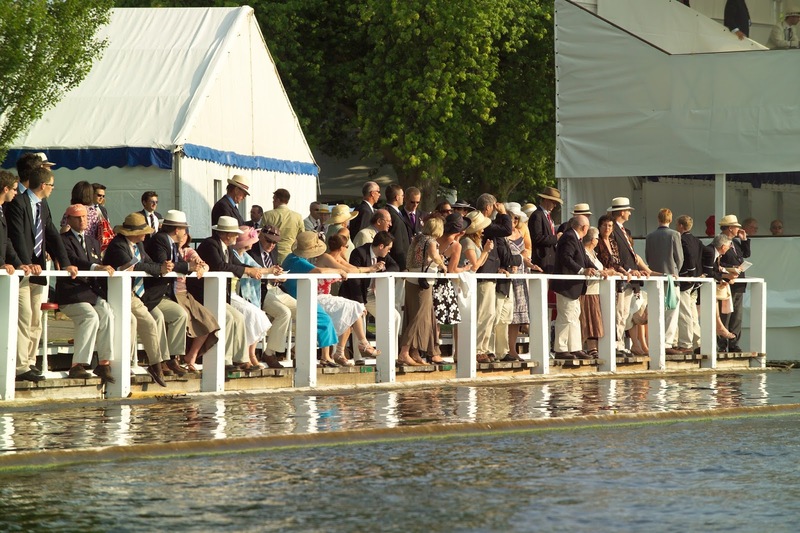 Upwards of 100,000 people attend Henley Royal Regatta each July. It is an event caught in a bubble of history with echoes of a bygone era everywhere: fine hats, striped blazers, picnics in the car park come rain or shine, decorated launches bobbing on the white booms that line the course, Pimms jugs clinking with ice, champagne and oysters, a brass band playing military tunes, and all the while a titanic battle is being fought on the water. Brentwood had dispatched the favourites, Eton, in the semi-finals the day before and Shrewsbury had beaten Radley in a slower time.There is expectation and excitement all along the river bank – not least in the Stewards’ Enclosure where nervous parents fidget, check their watches, exchange anxious glances and wonder why the commentator has not mentioned the race yet. But patience. Then the deadpan announcement over the loudspeaker: The final of the Princess Elizabeth Challenge Cup is in progress between Brentwood College on the Berkshire station and Shrewsbury School on the Buckinghamshire station. Brentwood College are the Canadian National School Champions. No mention of Shrewsbury’s pedigree. At the end of the island, both crews rating forty-two, Brentwood College lead Shrewsbury School by half a length. Forty strokes in from the start and the Canadians already have a half-length lead. Six minutes to go. The grandstand is full of Shrewsbury supporters. There is barely a free seat, the atmosphere tense. Elsewhere people are milling around the bars and chatting. Henley is, after all, a great social event. It marks the end of the summer season, after Ascot, and coincides with Wimbledon. At The Barrier, Brentwood College maintain their lead of half a length over Shrewsbury School. Time to The Barrier, 1 minute 58 seconds. A buzz. One second faster than yesterday. The Barrier is one of two points where intermediate times are taken, times that later will be scrutinised, compared, delighted at or despaired over. The spectators downstream can see the action first. Crowding along the river bank they get close-up views of the two crews battling it out in the early stages of the race. The two boats cross the line neck and neck. Then there is silence. The commentary ceases and the Finish Judge has to make his call. The wait seems interminable, time stands still. Then: The result of the Final of the Princess Elizabeth Challenge Cup was that Shr …. No need for the rest: the name of the winning crew is always announced first. The grandstand explodes in ecstasy … the verdict, one foot. More cheering. The narrowest, the shortest, the tiniest of winning margins imaginable, less than a sixtieth of the length of the boat. For Brentwood College a bitter blow. To be a member of a losing crew, however epic the race, there are no prizes. For the boys of the winning crew and their parents, unsurpassed joy, a matter of lifetime pride and for one man in particular this is a sweet victory. Eighty-three-year-old Michael Lapage watched his grandson, Patrick, help to win this great battle. Nearly seventy years earlier, on the same stretch of river, Michael had won silver for Great Britain in the 1948 Olympic Games. The legacy of a Henley win is a long one. It unites generations and brings tears to the eyes of the strongest of men. Five years later Patrick was rowing in the final of the Ladies Challenge Plate, this time for Harvard University against Britain’s Leander Club. From where I was standing close to the finish it was impossible to say who had won the race after six minutes of another titanic battle. The announcement came after what seemed like an age. The result of the Final of the Ladies Challenge Plate was that Harvard University of the United States of America beat Leander Club. The Verdict: one foot. Now what are the chances of that happening to the same young man five years apart? I am looking forward with eager anticipation to this year’s Henley Royal Regatta and hoping for some more history to be made and to watching grown men cry.